Glaucoma is the leading cause of blindness for aging adults. It is often referred to as the “sneak thief of eye sight” because it causes irreversible damage before individuals even experience any symptoms. Glaucoma is a disease which causes damage to the optic nerve, the connection between the eye and the brain. 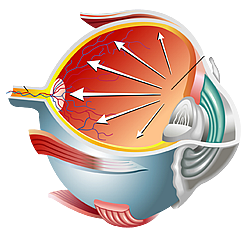 The optic nerve transfers the images we see to the brain to be recognized, translated, and coded. When the optical nerve becomes damaged, the delivery route for the images becomes blocked, preventing the brain from receiving image signals. If the brain does not receive these messages, we can no longer see the image. Damage to the optic nerve thus results in vision loss. Although the exact cause is unknown, glaucoma is typically associated with an increase in intraocular pressure due to excess fluid in the eye. There are four types of glaucoma, each contributing to a different factor of fluid build-up. Primary Open-Angle Glaucoma - This is the most common type of glaucoma and develops slowly over time. Due to age, the drainage of the aqueous fluid from the eye becomes impaired. This causes a back-up of fluid, leading to increased eye pressure. There are no symptoms for this type of glaucoma. Angle-Closure Glaucoma - This is the less common type of glaucoma and can develop slowly or quickly. It occurs when the drainage angle narrows and becomes blocked. This type of glaucoma typically occurs in people where the front chamber of their eye is shallow or in those with farsightedness. Once the angle closure becomes blocked, pressure builds rapidly, causing blurred vision, eye pain, headaches, halos, and nausea. Normal Tension Glaucoma - This type of glaucoma is related to normal eye pressure resulting from poor blood flow to the optic nerve. Optic nerve damaged is progressive as improper blood flow causes cell death. Secondary Glaucoma - This type of glaucoma develops as a result of trauma or disease. Medical conditions, physical injury, and medications can cause secondary glaucoma through damage to the drainage system. The material contained on this site is for informational purposes only and is not intended to be a substitute for professional medical advice, diagnosis, or treatment. Always seek the advice of your physician or other qualified health care provider. Images on this site represent models and not actual patients. E-mail may not be secure for the transmission of sensitive personal medical information. For more information regarding how we use your information, please see our privacy policies. We strive to answer electronic communications within 2 business days. Coastal Bend Eye Center is open during limited hours. Our physicians take emergency call at local hospital emergency rooms. In the event of a medical emergency, please seek care at the nearest emergency room.